China’s involvement in UN peacekeeping contributions has been on the rise for some time. China is also stepping up its own military and security operations abroad to protect its commercial and strategic interests, particularly in Africa. In doing so, China is exposing itself to a more complex set of issues – including international legal issues – with which it is only just starting to grapple. China’s contribution to UN peacekeeping over the last 10 years has expanded dramatically. 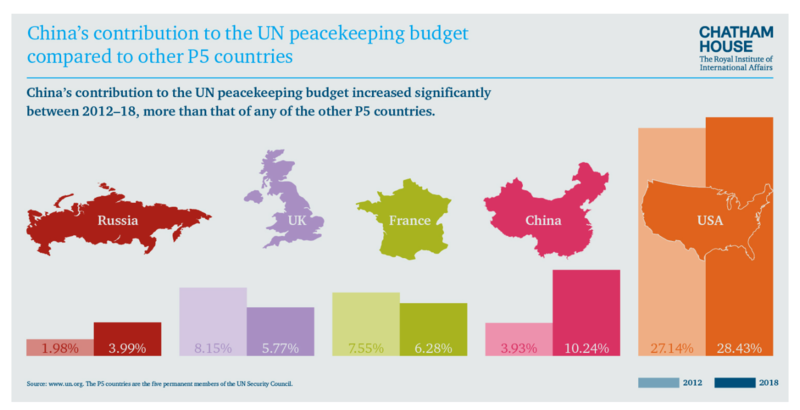 In September 2016, it pledged $1 billion to help fund UN peace, security and development activities, while in 2018 it supplied 10.3% of the UN peacekeeping budget, up from 3.93% in 2012. China is also the largest contributor of peacekeeping forces among the five permanent members of the Security Council. As well as its regular troop contributions, it has also established a stand-by rapid deployment force(opens in new window)(opens in new window) of 8,000 peacekeeping troops. For China, increased involvement in UN peacekeeping offers what it likes to refer to as a ‘win-win’ situation. China’s contribution is very valuable at a time when peacekeeping is in need of resources, given the cutbacks from the other four permanent members of the Security Council in both financial and personnel contributions, waning US support for the UN and pressures on the UN budget. At the same time, the increased role in UN peacekeeping helps to cement China’s image as a ‘responsible stakeholder’ in the international order. China’s contributions to peacekeeping missions also help to promote stability in countries in which China has significant strategic and commercial interests, such as Senegal, South Sudan and Mali. China’s increased involvement in UN peacekeeping has coincided with the adoption of a more pragmatic position in relation to its traditionally staunch adherence to the principles of state sovereignty and non-intervention. China was initially sceptical of the UN’s Responsibility to Protect(opens in new window)(opens in new window) (R2P) doctrine, endorsed by member states in 2005, which seeks to protect populations from gross human rights violations, and which can include recourse to use of force by the international community, if authorized by the Security Council under Chapter VII of the UN Charter. Over time, though, Beijing has softened its stance to intervention and has gradually acknowledged the ability to respond to humanitarian catastrophes in certain circumstances, for example voting in favour of the Intervention Brigade in the Democratic Republic of the Congo in 2013. The softening of China’s stance on non-intervention is also evident in the significant rise not only in the involvement of Chinese troops in UN peacekeeping, but also in the deployment of Chinese military and security forces in a number of African states in order to protect China’s investment and infrastructure projects located there. In 2017, China established its first foreign naval base in Djibouti, and in 2018 it held military drills in several African countries. The significant increase in China’s military presence in Africa since 2015 gives rise to a number of more complex issues for both China and the local communities involved. According to a recent report, China’s growing military and security presence in Africa is leading to concern in some local constituencies. The fact that China’s state-centric perception of security and development downplays the importance of human rights is likely to compound these tensions on the ground. The growing presence of Chinese peacekeeping, police and security forces abroad also carries implications for China in a number of different areas of international law with which it has only recently started to grapple. These include the law on the use of force and, given that many Chinese infrastructure projects are situated in fragile states, the law of armed conflict. The mushrooming presence of Chinese companies and investments abroad also carries implications for the Chinese state, and for the companies concerned, under international human rights law (particularly the UN Guiding Principles on Business and Human Rights. The international law on state responsibility could also be relevant if security companies owned or employed by the Chinese government, where their actions are attributable to China, become complicit in breaches of international law by other governments (such as human rights abuses). Compared to other areas of international law, such as international economic law and the law of the sea, China has not invested much to date in education in these areas, which may leave it exposed as it increases its global footprint. It was clear from a recent Chatham House roundtable at Columbia Law School in New York that China is now seeking to rapidly upskill in these areas. China’s global economic and security ambitions appear to be tilting China towards a more interventionist approach, which is extending beyond UN peacekeeping contributions towards security and military missions of its own. Time will tell how China will respond to the challenge of burnishing its image as a good global citizen while maintaining an approach to peacekeeping, security and development which is closely informed by its own economic and security interests.